I don’t subscribe to “the world is a mean and scary place” agenda that is prominent in our media these days. Our news has become a joke. With a 24 hour news cycle, they literally scrape the bottom of the barrel for stories to keep their ratings up 24/7. And guess what sells? FEAR. I’ve backpacked over 400 miles in the back-country alone. I’ve traveled to 8 countries alone. I’ve lived alone in some rough neighborhoods in and around San Francisco and Oakland. And now I live and travel in an RV alone. Guess what, I’m still here. Unharmed and safe and sound. The world isn’t as scary as some would have you believe. 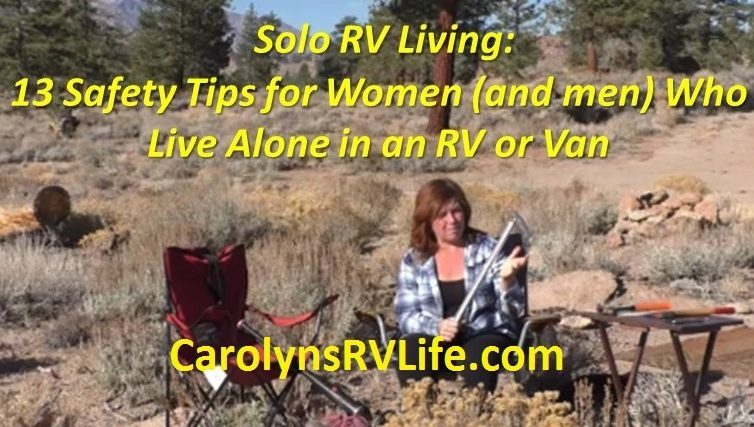 16 Tips for Safety when you live and travel alone in an RV or Van. Always give the impression you aren’t alone: put out two camp chairs and a couple pairs of shoes. Get a giant pair of men’s shoes to put outside your door. 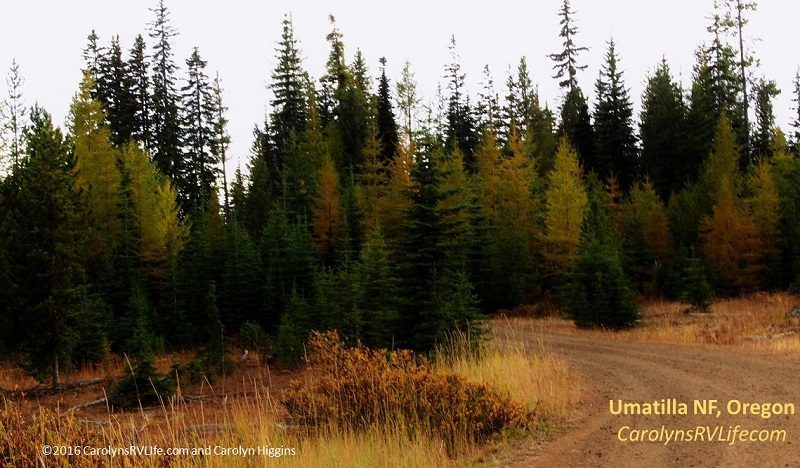 Carry bear spray and learn how to use it – BEFORE you need it! Carry a baseball bat (and glove so it doesn’t look like a weapon, which is illegal in some states, like California) and keep it by your bed at night. 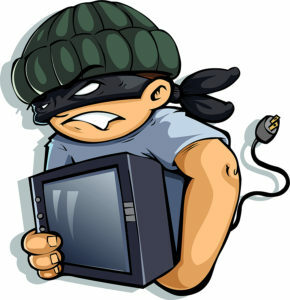 Keep your cell phone close by at night and know where you are: your address, GPS coordinates, etc. Keep a set of keys with you at all times and another someplace inside your RV or Van that would be easy to grab in an emergency. Get intimidating signs for your windows. “Beware of Dog” or something gun related. Be aware of your surroundings! – Know who is around you and what kind of people your area attracts. Get out if it doesn’t feel right. Trust your gut. NEVER EVER second guess your gut! If you feel something isn’t right, just GO. NOW! Point your RV, Van or Rig in your escape route. Don’t get stuck in an emergency always be pointing in the direction of your ‘out’. Strategically place your tools around your RV. Don’t just leave your tools in one place, you never know which direction danger could come. Leave tools around your RV so you can get to them no matter where danger might come from. Use your car alarm. 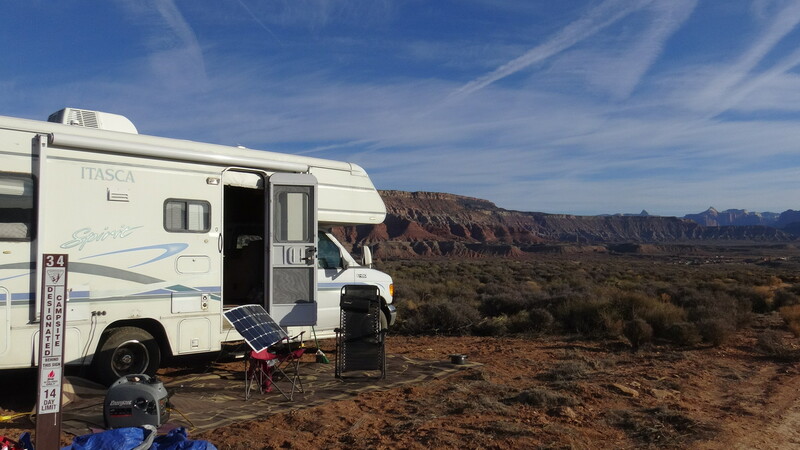 In an emergency sound your RV or van alarm – that could scare off potential threats. Buy a siren or loud horn. In an emergency this will attract attention and scare off the bad guys. Get a dog! A scary one, not a fluffy white one. A gun is a personal decision. There are plenty of gun owners out there who want you to believe if you don’t have a gun you’re just asking to be murdered, raped and pillaged. The fact is, street smarts, common sense, and gut instinct go a long way toward protecting yourself. Don’t let anyone tell you you can’t be safe without a gun. If you’re comforable with a gun, get a gun, But if you’re not, don’t. Trust me, you WILL most likely survive. Hi Carolyn, first let me say thanks for sharing. Im going to recommend buying several solar lights .. one you put near your doors. I bought mine from Amazon and also got the tape adhesive. They require no batteries. The LED light are bright. Will he watching mire videos. Ms. Pat – thank you for the recommendation of solar lights. Sounds like a great idea! Truck campers have a drawback, you have to get out of the cab and walk around to get into the camper. I recently upgraded to a 26 footer. I can park, go potty, fix a sandwich and no one knows if one or nine are in the vehicle. Also, a can of wasp spray is better than mace. The as attacker will need medical attention or go blind. The attacker feels safer going to ER with wasp spray than a gun shot, thus may not attempt to have a buddy patch him up. Just keep a can by your door and it will be multipurpose. For those who like the thought of a gun but not the actual physical item…toss an empty box of handgun or shotgun shells on your dash with an old hunting hat. Women get a well used man’s jacket (stereo type leather biker, Levi with patches, hunting vest/jacket) leave those items on the front seat at night. Wishing all the hobos, gypsies, and vagabonds the very best this lifestyle has to offer. thank you for the info Cynthia!! Hi Carolyn!! I am just getting ready to start my adventure with in the next few months! I found your website a few days ago googling good places to boondock. I have a 38 ft rig so my options will be more limited. Any I wanted you to know I have placed you in my favorites and have been enjoying searching through your site. I just got done watching the safety tips video and I love it and want to say THANK YOU!!!!!! Kim- In a few months! WOW. it’s going to fly by! I’m happy and excited for you! Hi Carolyn ,Thanks for sharing your experience with us ,I learned good tips from your videos and I will be following you and your advise . We have our own 24 feet (7,40meter) European RV. We travel trough Europe since 1996 and also have our own trics to protect us. Mostley we’re sleeping on spots near a church or by the seaside. Only to visit a bigger town we’re going on a campground. Until now, we haven’t, and i knock on wood, any violenc or somebode broke in. In Europe it’s forbidden to wear a weapon. Even pepperspray is a forbidden weapon here. But this is a tip i get from a police officer. If you lay down a few cans of deodorant by each door and your bed, you can spray it in the eyes if you need to. It’ll not be as hard as pepperspray, but it gives you the chance to get away. Thank you very much! Safe travels to you both! Same. 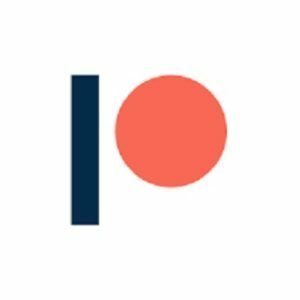 I’m from New Zealand (single woman) and thinking of doing this fulltime, but we’re not allowed mace or pepper spray either (and needless to say no guns). Have no idea how I’d defend myself if someone broke in! Great video, Carolyn! I especially enjoyed your opening about enjoying alone time. I am the same kind of person, but I’ve never been able to say it as well as you did. Your tips made me think. I’m going to buy a second chair! And I think your best tip was to travel with a dog. Any dog. Wonderful alarm and deterrent! I had to laugh at the “don’t injure yourself” advice. I can be a bit clumsy and have had to learn to slow down and not get hurt!! I actually had to PRACTICE that in my practice hikes for the JMT! I didn’t want to get hurt 50 miles out in the wilderness alone! A recording of a man’s voice, perhaps on the cell phone. And shouting/barking things like who’s out there and the sound of a gun cocking. The possibilities are endless. Cell phone around your neck with 911 on screen already if there is ever an uneasy feeling while occupied. Oh another loud sound, once my bicycle tire burst from too much air and it scared the daylights out of my neighbors at night lol. I don’t know functionality, but a knife on the end of a bat would give distance from an attacker rather than up close wrestling where it might be taken away. 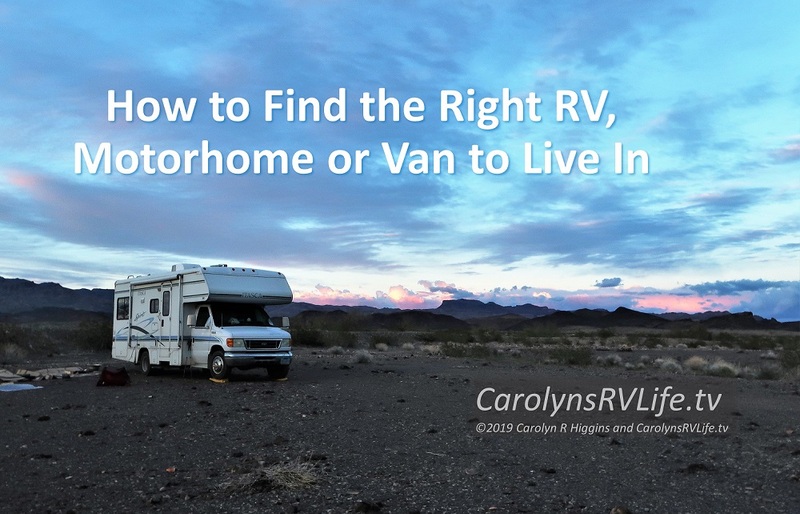 I loved it when you suggested parking the RV or pointing it in the direction of an escape route so that it is easy to leave when I notice that something is wrong. This method paired with my ability to sense danger like a stray cat will surely help me out when worse comes to worst. Thanks for sharing. I just wanted to know how to stay safe since I plan on living in an RV alone from now on. Thanks!